I am shortening this original idea from two websites to just one this podcast. After I took all the screen shots from one website, I knew I had enough material to cover in one podcast by itself. So we’ll do a picnik with pi instead of a picnik with pixlr pi. With Pi Day right around the corner, I thought it would be a good time for a Pi Quilt. One of my newer listeners e-mailed me with a great idea for a pi quilt. Pi is the wonderfully important mathematical relationship between a circumference of a circle compared to the diameter of that circle. A mathematical ratio. Take the circumference (perimeter, measure along the outside) and divide by the diameter (width across the largest part of the circle) and you get this wonderfully irrational, transcendental number. Which approximates to 3.14159 …. We can’t exactly find pi because the number doesn’t stop. There have been geek contests to see who can recite by memory the most digits to pi, which the record is somewhere in the tens of fifty thousands at this point. There is a nice relationship between a circle’s area and pi. The area of a circle is the value of Pi times the radius squared. Which may be useful if you’re wanting to calculate the exact area of drunkard’s path blocks used in a quilt. But because fabric isn’t purchased in circular amounts, it may be best to know the diameter of each circle you need and find out how many circles you can get from this value instead of relying on the area of the circle. Pi Day was invented by the San Francisco Exploratorium to help promote the mathematical concept of Pi and mathematics in general. Pi Day is celebrated on March 14, (03/14 in the United States) and it also happens to be Einstein’sbirthday! Could we make a Pi quilt to take on a Picnik? Using an idea by listener Lynn through e-mail, I recreated a pi quilt design using the online computer program Pixlr. My original idea was to do a Pixlr and Flickr tutorial when talking about pi, but then i discovered Picnik through Flickr and by the time I got screenshots of Picnik I had more than enough for one podcast! So instead you get a Pi quilt created in Pixlr and a tutorial on Picnik. Picnik with Pi. Here is my Pi quilt idea. As you can see this quilt has different (monotone) lengths of bars representing the different numbers of pi. I would love to embroider (or quilt) in between the information about Pi and Pi day so that people know what they are looking at. This uses length to impart information instead of color like my DNA quilt idea. Which is what Lynn suggested for pi day because she saw somewhere an artist was doing this. For the color I went with monotone, alternating a dark and light color for each digit. You could assign different colors to the different numbers if you wanted to. I did have to break up some larger numbers when I hit the edge of my quilt. This design would be using fairly large strips of fabric, but you could always reduce the square sizes. Okay we have pi, now lets take a picnik! I started looking at the image editing functions using Flickr. I decided to make a tutorial about a few of the features of Picnik by way of Flickr. If you have a Flickr account, you can log in and follow along and see how to modify your pictures. If you’ve never used flickr before one way to upload photos after you’ve signed in is to go to the You tab and click on upload photos. You find the image on your computer. Then you decide if you are making private or public photos and click on the button to upload. Don’t forget to add a description if you want. 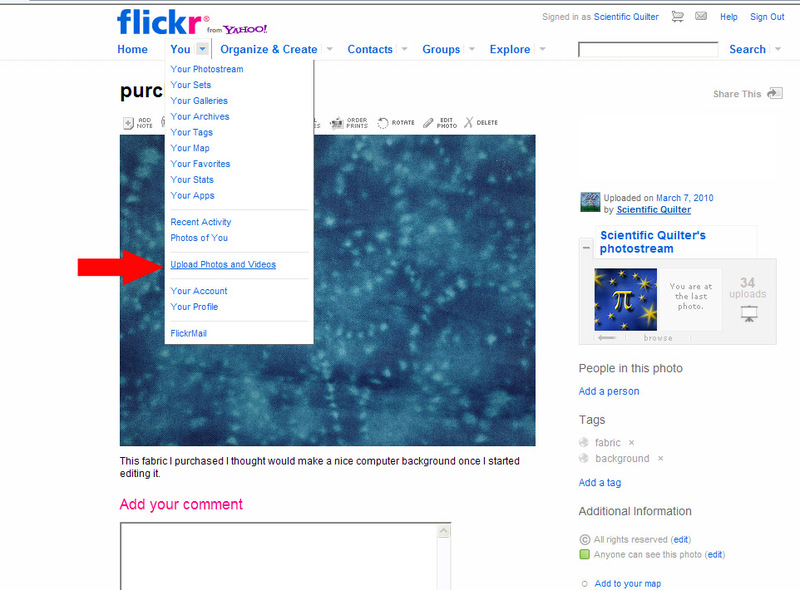 To get to Picnik through Flickr, you click on the edit photo button at the top. Then you are taken to the picnik main page. I noticed right away you can zoom in and out using the bottom right hand side. On the top there are tabs of edit and create. Looking at the edit tab first, we can examine some of the color and basic options here. If the picture is not straight you can rotate. You can also flip. I would think the flip could be useful if you had your own patterns which you needed the reverse for applique or transferring to fabric for embroidery or quilt markings. NO stealing and posting other people’s patterns up on flickr. No fair. Do your own. Delete or set to private for only you. Read other artist’s comments about what you can do with their patterns before you try this. The exposure button would be useful to get the right contrast. If you click on the advanced tab you get a histogram on the right that shows you how much of each color value (light or dark) is in the photo and you can play around with these sliders as you would do with levels in a photo editing software like Photoshop. Moving to the create tab you see a menu of different items to the left that you can play around with. The green bars on the menu items on the left are expandable and show many effects. Anything that you don’t have access to due to premium status will say premium. But there is plenty to do for free! Just below the create tab are smaller tabs. Clicking on the effects tab, one of the first things is black and white photos. Now I discussed black and white photos using Photoshop in this post/podcast. What I really like is you can do the splash of color by clicking on the little brush symbol on the bottom and brush away the black and white. Another thing you can do is draw on your picture. I used the doodle effect and then chose the difference mode. This should (in theory) give me the exact opposite of what I have. So a dark blue becomes a light yellow, which makes sense if you look at a color wheel. I drew on the corner of my image and created instant contrasting colors and can see how they look together. One thing about doodle is if you don’t use a mode it is just solid color, which looks slightly odd next to fabric. But if you want solid color, that’s the way to go! Scrolling down effects, then clicking on the sandbox gives me more options. Like hexagons! I could do my own grandmother’s flower garden quilt without the flowers! And since I am a sucker for effects this is the ripple effect which I created equally sized waves along my picture, which gives a block effect. I don’t know what this is useful for, but it is soo cool! The next mini tab is stickers. I chose a geometric square that had yellow color without choosing difference or hard light or anything like that. You can see the solid color is distracting. No half square triangles here though. But they do have equilateral triangles so we can create flying geese units. In the last mini tab is frames, which could be very useful to figure out borders. It doesn’t look like you can do multicolored or pieced borders, but for basic color you can get two borders with different thicknesses. This could be useful for uploading a completed quilt and could give a good idea of where to go with borders (basic colors and sizes). Before leaving picnik if you like your changes to your photo you should save (top right of the web page). When you do, it doesn’t overwrite your original image, and you only have that option if you have the premium version. Later I discovered that you can go to Picnik’s site directly and upload photos from flickr, Facebook, Photobucket – all sorts of photo hosting sites. You can also download to all those places as well. I mentioned something about a giveaway in my preview post. Since I was already on flickr I set up a flickr group that is open to the public. I have been thinking about my strength and rather than go science/math with this group, I thought I’d make a flickr group with the focus on computer aided design of quilts. The giveaway has to do with the Scientific Quilter Computer Design group on flickr. A charm pack of Moda fabric. I won it recently at a mini quilting retreat. As you may be able to tell this isn’t the fabric I gravitate towards. Although I need to expand my tastes, I know this will never get used if it stays in my house. I am going to draw up a spreadsheet on google docs to help me organize this. I am going to try a point system to give people multiple ways to win. Hopefully this will not make my brain completely explode! Each point is one name in the drawing. How do you earn points? This is going out later than I wanted, so I’ll extend the deadline to Saturday April 10th at midnight (US) central time. 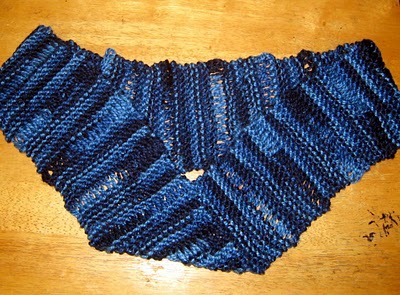 Allyson at Guilding the Silly has an awesome periodic table knitted shawl that she created. 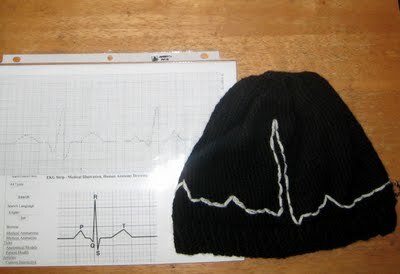 She also made an awesome hat that has EKG patterns on it. But I also particularly like the Möbius scarf of hers. Thanks for waiting so long Allyson! For Pi Day, maybe you want to take the Pi Day Challenge? I haven’t explored this, but feel free to try it out! Oh yeah, I am planning on taking a fractal class from Quilt University. Classes start on April 16. It will be my first online quilt class, but I am excited about the topic – and hope to report my progress in the form of podcasting. Send me an e-mail if you plan to join me! Rachel is doing her own genome quilt on her site. Check it out! Check out the Carbon Quilt Initiative if you want to help out Adam and spread the word about carbon dioxide. Jean at the Quilted Cupcake inspired the way I did the giveaway today! Suz found a good tutorial for navigating the DNA website I had trouble with last podcast. Thanks to all the commenters on the DNA post and all the support when I was very frustrated with myself. So far March is going much better than February. I am currently taking a Quilt University course, Playing with Lines and Shapes. It’s pretty interesting and I like it so far. I’ll be interested to hear about your class experience. saw this on craftster…thought of you…. i do enjoy your podcast while i am quilting. You have some good info and links. I think your voice is fine and not too monotonous , but would like to hear a little more on topic. Please enter me in the contest for the MODA fabrics. Even if they aren’t my style i would use them in a charity quilt. I have a science background, BS in chemistry and MS in Physiology but have been a professional studio potter for 30 years. i took up quilting in 2004 and now it is a passion. I am currently working on a 60 inch eye ball using a skewed storm at see pattern I drafted. 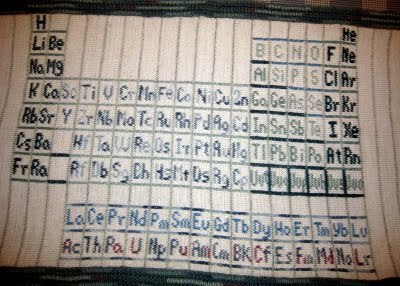 I really enjoy having a scientific theme to my quilts., I suggest you check out the link below to see Betty Busby’s quilts. Many have a very science type theme and she has shown in some science type shows.. I tole my daughter and my friend about your pod casts and heard about yours from Annie smith. Too bad she has slowed down. If I had been home I would have baked a pie for pi day. today is Bach’s birthday and his music is very mathematical. thanks for all your woek podcasting. Vicki check your e-mail from the Scientific Quilter! Thanks again for the Betty Busby site! WOW you even blow me away. I use PI every day. Did you know there is a tape measure called a Pi tape to measure the outside and inside diameter of a tube. It is set up like a slid rule so you can read in thousands of an inch. Thats how us aircraft people know if something will fit the nexr assembly or not. This would be really cool to see! The tape measure I mean. It really goes to show how much we value the ‘base 10’ counting system for what we are used to measuring, but if we think about it, we could use any system, like radians and pi. I would never have thought of that!